Fine dining in Charleston, South Carolina is bountiful, so the trick may be deciding WHERE to eat in Charleston among all the amazing options. “Obstinate” and “ordinary” may lead diners to wonder about restaurants with those words in the name. Wonder no more because they are the buzzwords for hitting the dining jackpot in Charleston restaurants. Prepare to eat well and enjoy the fresh tastes, fun atmosphere, and fabulous service. 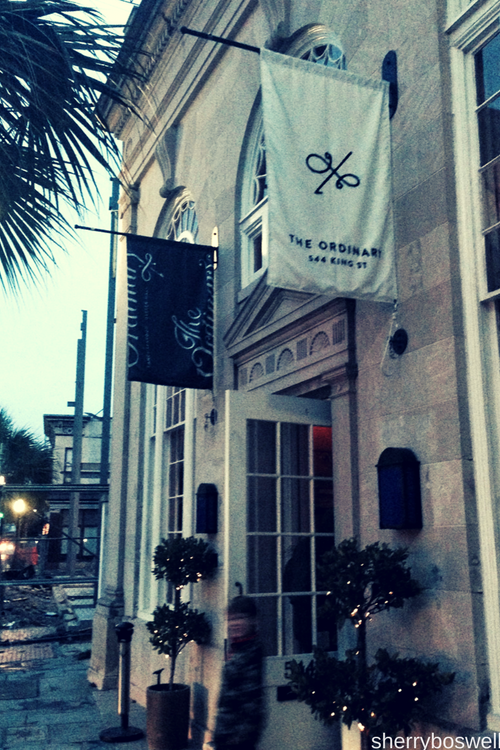 The Obstinate Daughter and The Ordinary: Two Awesome Restaurants in Charleston, SC. Photo credit: Melodious TravelingMom Sherry Boswell. Charleston, SC, is a charmer in every way: history, culture, attractions, and, oh yeah, the FOOD. 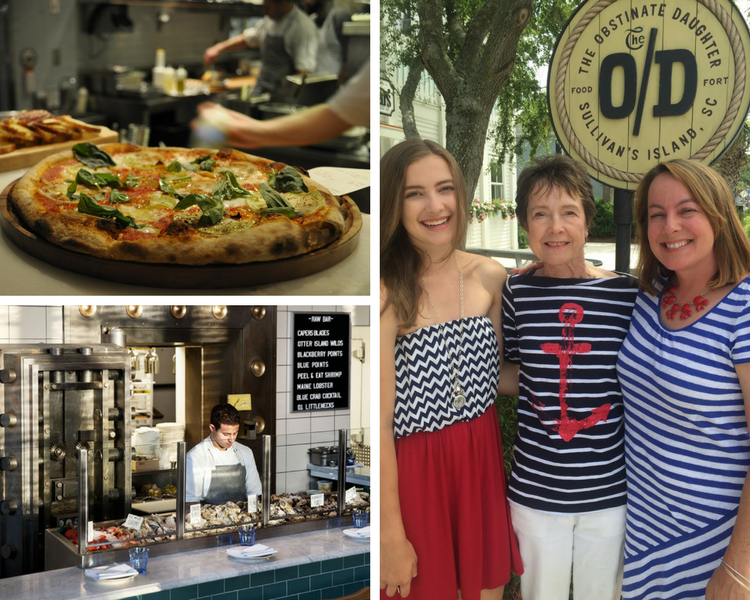 From the beach locale of The Obstinate Daughter to the downtown delight of The Ordinary, these two Charleston restaurants wowed us with their foodie chops and the relaxed atmospheres. This is high quality dining, so count on shelling out a bit. Also, you should consider if a fine dining experience is appropriate for your family. But if the budget and the family dynamics are up to it, these two Charleston restaurants are well worth it! Located on Sullivan’s Island, The Obstinate Daughter is paying homage to the region’s rich Southern revolutionary history. The restaurant’s quirky name comes from a London political cartoon titled, “Miss Carolina Sulivan, one of the obstinate daughters of American 1776.” Calling itself a “food fort,” The Obstinate Daughter is indeed a stalwart of fine dining that will fight off its competitors with its robust menu and elevated food. This London cartoon was entitled,“Miss Carolina Sulivan, one of the obstinate daughters of America, 1776” and the inspiration for the restaurant’s name. I’d say this restaurant is indeed obstinate in the sense the kitchen is unyielding in turning out awesome dishes that you won’t find anywhere else. So its willingness to be inventive and playful in their approach to food could be likened to Carolina Sulivan. Hey, who doesn’t like a great name? I’d call the design “beach chill without pretension.” Have no doubt, the Obstinate Daughter is upscale, but not snobbish. You won’t find the nautical theme thrown in your face, but the cool blue and earthy tones, lights suspended on ropes, and rough hewn walls reminiscent of wooden ships give the feel of the ocean without being over the top. It is this subtlety that defines the restaurant and makes it such a popular destination. Casual beachy vibe includes rope lighting, gray wood, and blue tones. Photo by Sherry Boswell, Melodious TravelingMom. Chef Jacques Larson and his team are the creative minds behind the inventive menu. The dishes are a culinary mashup of different cuisines. 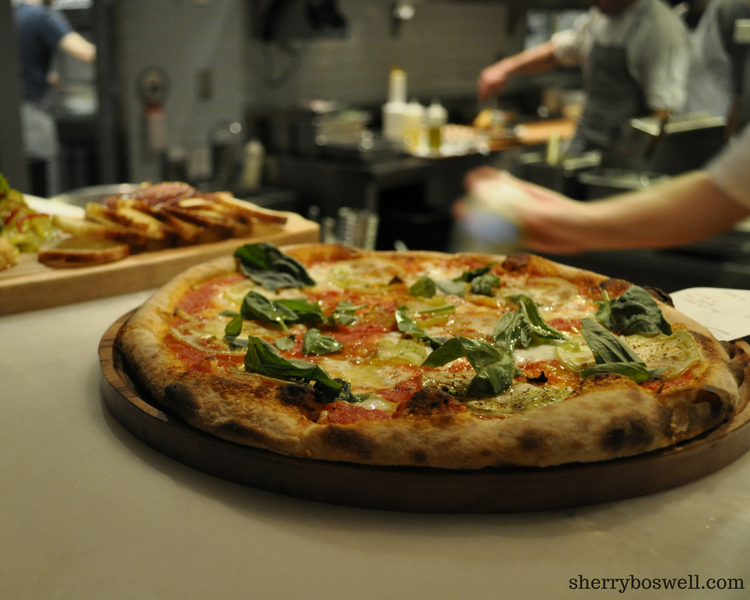 Pizza, pasta, small plates and a raw bar are the focus of the menu. 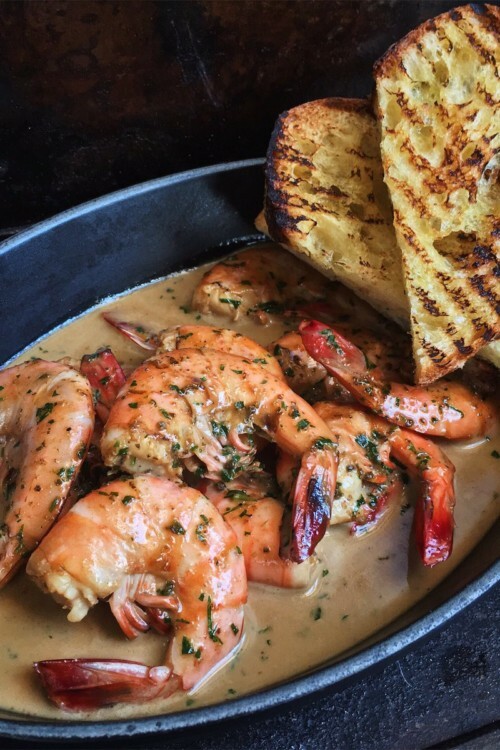 Homemade gnocchi and wood-fired oven pizzas are served up alongside the fresh fish of the day and raw bar items. The coastal ties are strong here, as oysters and seafood arrive fresh off the boat. Be forewarned: there is no kids’ menu. If your children don’t like to try new cuisines or handle fine dining well, then this isn’t the restaurant you are looking for. My tween is our picky eater, but he was satisfied with pizza. My teen, on the other hand, loves trying new dishes. The O in The Obstinate Daughter must stand for “Oh My Goodness Good!” The real stars for me were the Steamed Mussels and Ricotta Gnocchi. Photo by Sherry Boswell, Melodious TravelingMom. After a recommendation from our server, I ordered the steamed mussels for the table to share. I messed up…I should have ordered more! When I returned to the table, the mussels were being devoured by our party of 6. 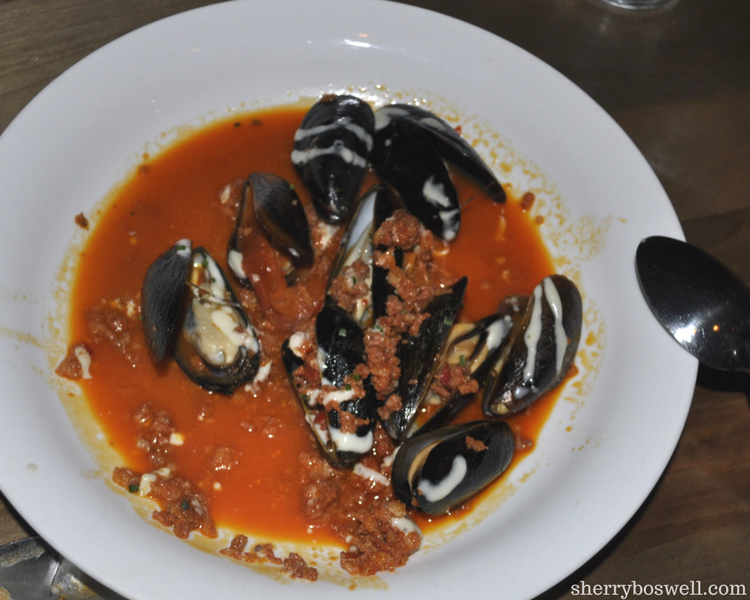 Prepared with nduja, white wine, roasted red pepper, and aioli, the mussels were swimming in flavor. Too bad I didn’t get our photo before my family started eating them. You know it’s a hit when everyone is claiming credit for ordering them! Dive right into this bowl of mussels. Photo by Sherry Boswell, Melodious TravelingMom. 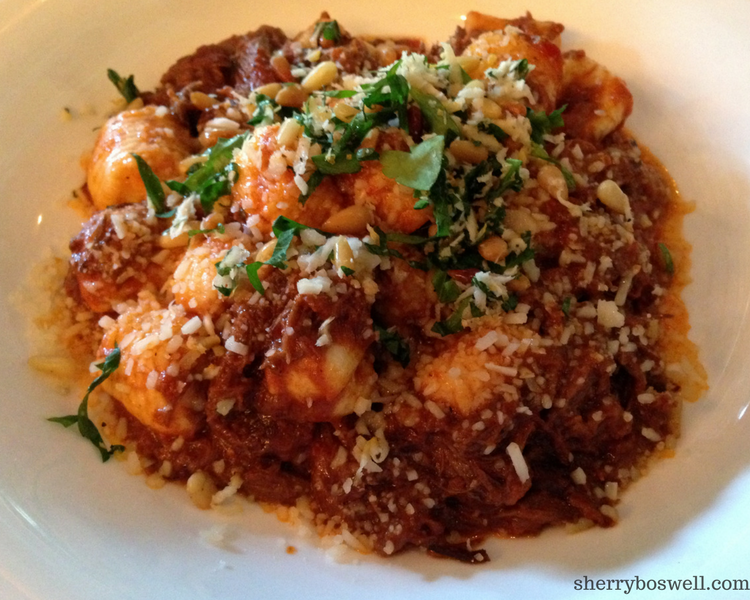 But my all time favorite dish had to be the ricotta gnocchi with short rib ragu and horseradish gremolata. I was already leaning towards this dish when the server said it was his favorite. Here especially, ask the servers. They know the food and have likely eaten it a lot, so it’s never a bad call to get their input. The Obstinate Daughter makes some of the pasta on site, and the gnocchi were indeed as described: pillows of love. It was divine and sublime. Hello, gorgeous gnocchi! Easily one of the best dishes I’ve EVER had. Photo by Melodious TravelingMom Sherry Boswell. My tween son noshed on The Moultrie, a pizza of tomato, mozzarella, pepperoni, Mepkin Abbey shitakes, and parmesan. He loved every bite. Wood fired pizza is one of the popular dishes on The Obstinate Daughter’s menu. My kids’ favorite is the Moultrie. Photo credit Sherry Boswell, Melodious TravelingMom. From the seared swordfish paella with saffron rice, chorizo, mussel, scallop, and shrimp to the Orecchiette (lamb bolognese, sheep milk ricotta, mint), the food knocked our socks off. Everyone oohed and ahhed, and we stuffed our faces. 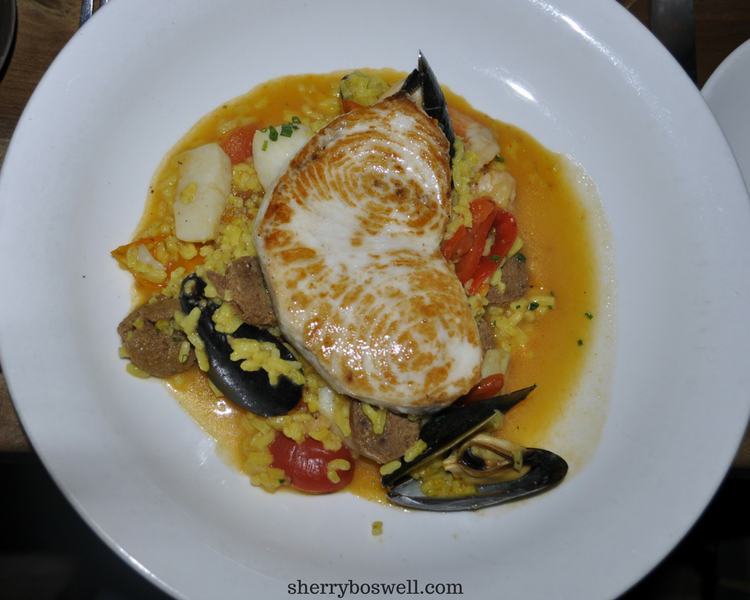 Seared Swordfish Paella with saffron rice, chorizo, mussel, scallop, and shrimp is swimming in flavor. Photo by Melodious TravelingMom Sherry Boswell. Extra brownie points: the restaurant is Green Restaurant Certified, having met exacting standards in areas of water efficiency, recycling, sustainable food, energy, and sustainable durable goods and building materials. I had never heard of this before, so I did some reading. Looks like the wave of the future for conscientious restaurants. 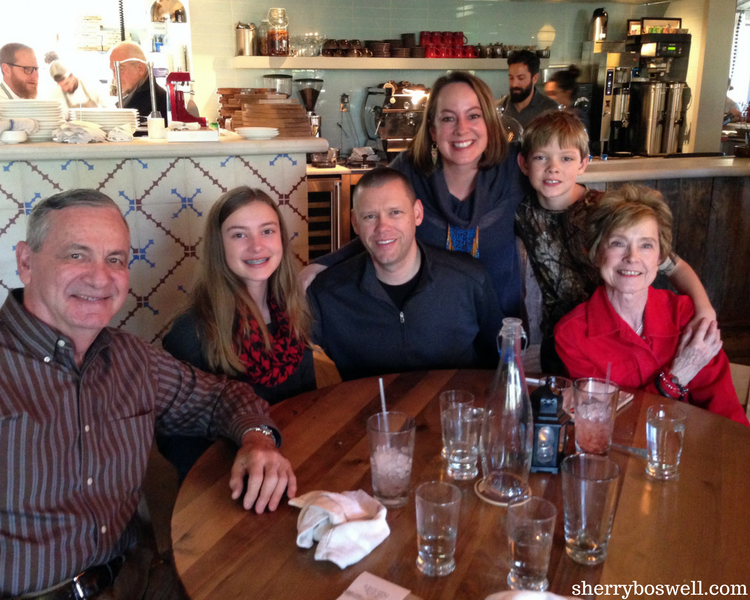 Our multigenerational dining experience at The Obstinate Daughter earned 6 big thumbs up for my family. Photo credit: Sherry Boswell, Melodious TravelingMom. 1. Our food was phenomenal! 2. The relaxed boho chic cool atmosphere was perfect for the beach. 3. Diverse food offerings gave everyone in our party something to suit their palates. If this is obstinate, I don’t want to be any other way. 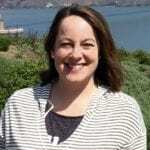 TravelingMom Tip: Book through Open Table to earn Dining Points which may be redeemed for a Dining Rewards Gift or an Amazon.com Gift Card once you reach the minimum point value. I am well on my way to a $20 gift from using Open Table. The Ordinary is anything but and housed in a renovated bank building. Photo by Sherry Boswell, Melodious TravelingMom. 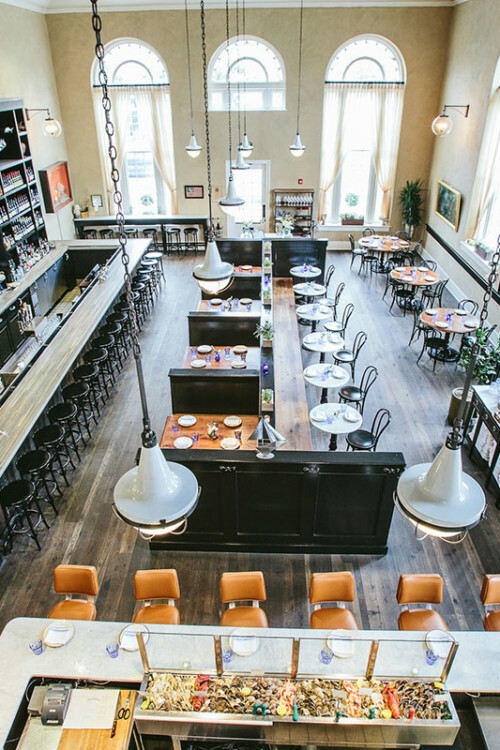 Housed in a old bank building, The Ordinary is anything but what its humble name implies. Instead, it is a shellfish lovers mecca! From the moment we stepped into the cavernous main room with its 22 foot ceiling, we knew we were in for a culinary treat. 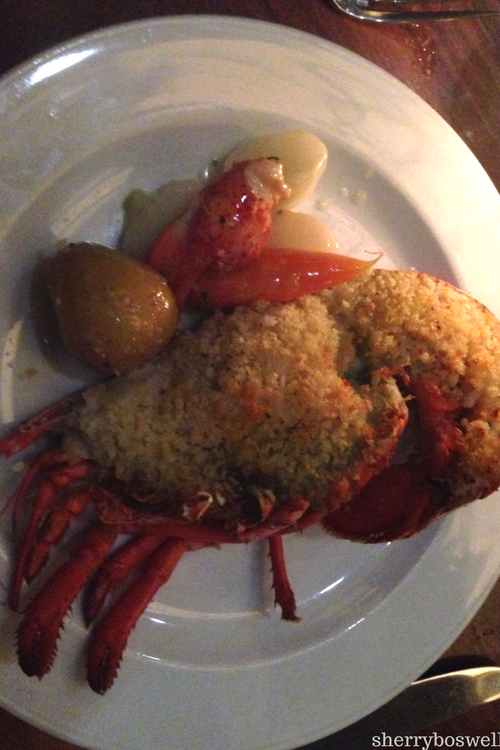 Staring us in the face was a sumptuous raw bar in front of what used to be a bank vault door. It’s also always a good sign when a restaurant is packed the entire time you are there. The energy was vibrant, with lots of laughter and smiles around the room. It doesn’t hurt that this restaurant is the brainchild of Mike Lata, founder of the award-winning FIG restaurant. When he opened The Ordinary in this former bank building, the foodie world took notice and no surprise, it seems to be making bank. Much of that is due to the freshness of the ingredients, a fact the restaurant prides itself on in working with local and regional fishermen, crabbers, oystermen, farmers and producers. Eclectic, open design at The Ordinary seafood brasserie and oyster bar. Photo credit: The Ordinary. These oysters didn’t last long at our table. Photo credit: Melodious TravelingMom Sherry Boswell. 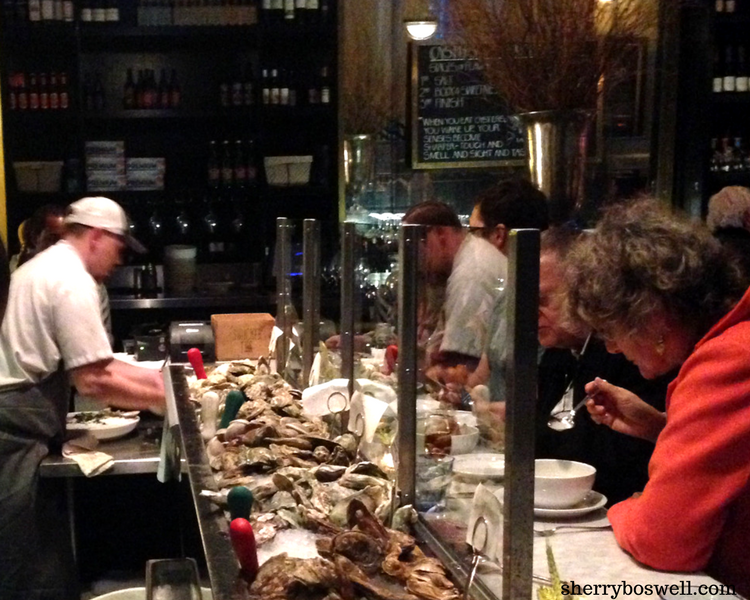 Food and Wine included The Ordinary in its list of top oyster bars in America. 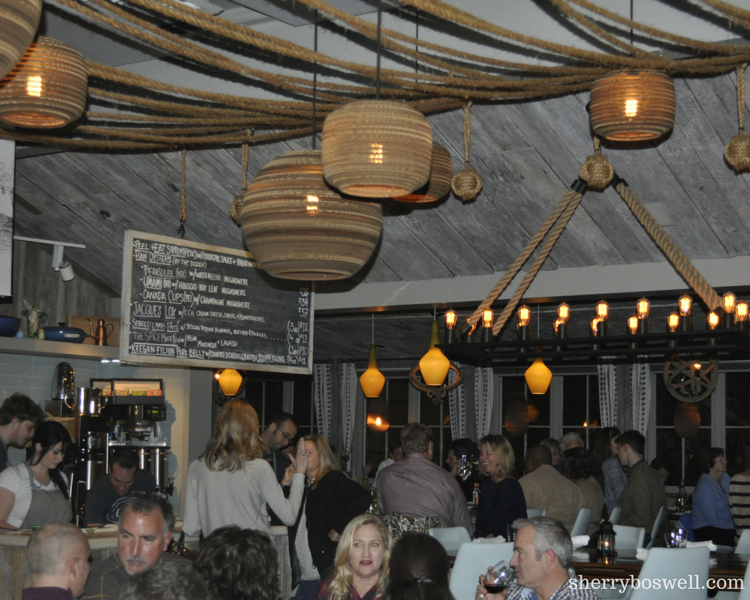 Joining that list was one of our favorite restaurants from our Boston trip, Island Creek Oyster Bar. 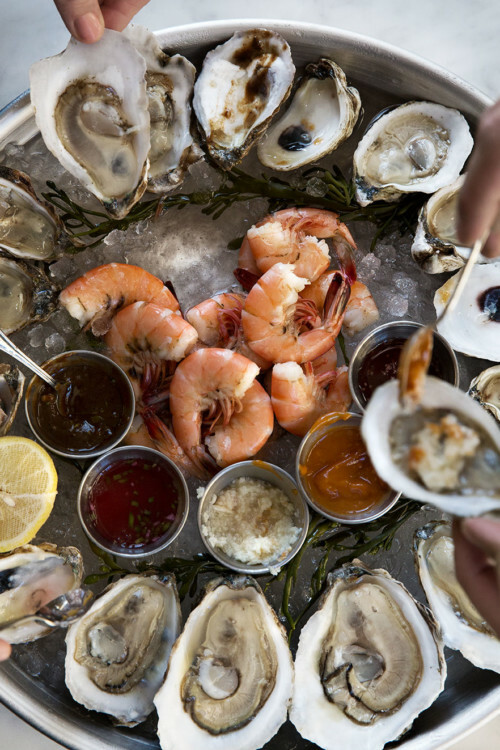 It’s not all about shellfish and the raw bar at The Ordinary because the restaurant offers many fresh catch choices. The Ordinary’s standout dishes included the smoked oysters, the Nova Scotia and Capers Blades oysters, the BBQ shrimp, and the baked stuffed lobster. My mom chose the baked stuffed lobster. Great choice for lobster lovers. Photo credit: Sherry Boswell, Melodious TravelingMom. When a restaurant calls itself a seafood hall and oyster bar, then you can bet the shellfish will be fresh and that you best order seafood. Check out the original bank vault door behind The Ordinary’s raw bar. Anything but ordinary. Photo credit: The Ordinary. 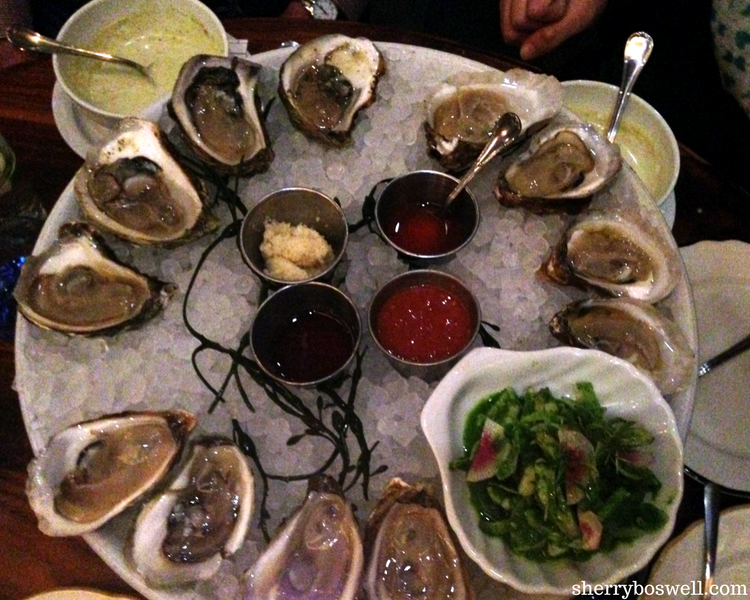 For a celebratory meal and the freshest oysters around, this was a wonderful (albeit expensive) option for a family. 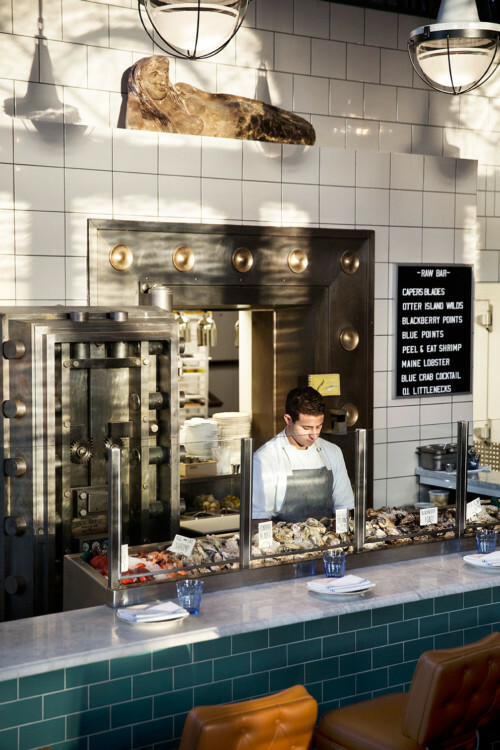 Seafood lovers will be in heaven at the Ordinary. Photo credit: The Ordinary. The Ordinary brims with culinary confidence and exceptional food. The ambiance is fun, the food fabulous, and the freshness is unparalleled, so your belly will be so so happy you ate here. Stick with the seafood tower, ask your server for recommendations and always order them, and give one of The Ordinary’s daiquiris a try. (Not your normal syrupy sweet concoction but true mixology and how daiquiris were intended to be made). 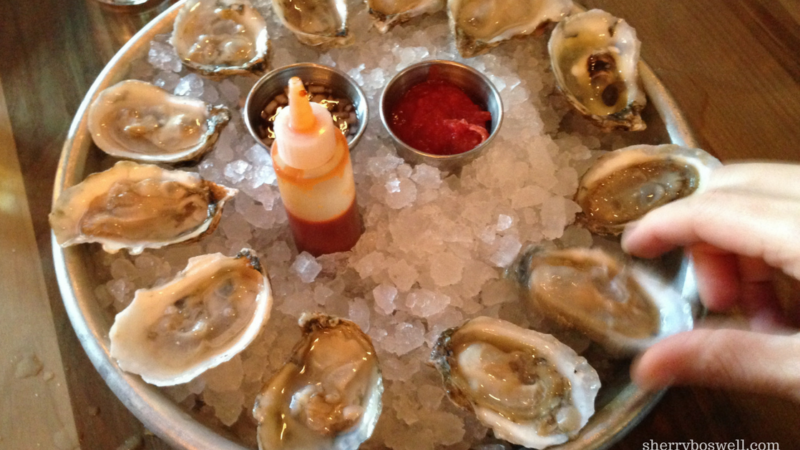 The hustling/bustling raw bar showcases some of the finest shellfish options in the Lowcountry. Photo credit: Sherry Boswell, Melodious TravelingMom. So don’t be Obstinate–or run from the Ordinary. 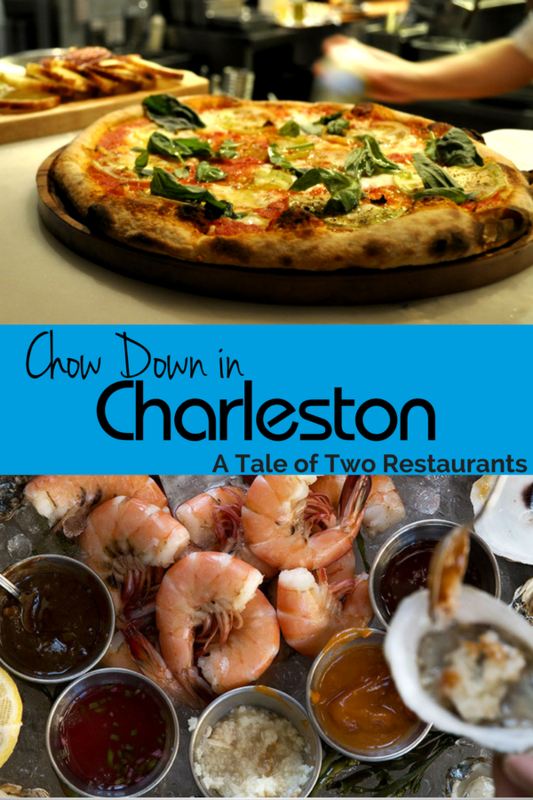 Be sure to check out these two dining gems next time you find yourself in the charismatic city of Charleston, SC!